D-Link Camera An Hour Giveaway! Here is your chance to win a D-Link Wireless N Cloud Camera! These are neat little cameras from what I've heard and could be great for keeping an eye on your home and pets while away or even as a Nanny Cam or Baby cam. Up to 40 winners per week and yes you can win more than once. There is no end date as this is an ongoing promotion from D-Link! The link below is my personal referral link to enter, once you enter you will get your own link to share with Facebook Twitter, or email! Disclosure: I will receive an entry into this sweepstakes for every person who clicks through and enters through my link. October has been a month of Breast Cancer Awareness. Having lost one of my favorite people to breast cancer, I know the importance of beauty. It begins on the inside and shines through--regardless of the trials. This giveaway is not only about personal beauty but decor and more. Bedly offers a monthly subscription that offers interior decorating re-imagined. Subscribers take a brief (3-minute) survey to asses tastes, budget and needs and then each month, a decorator will personally pick a home décor item based on those preferences and send it in a Bedly Box. The items include accent pillows, wall art, decorative accessories, and much, much more. It's a convenient service for a mere $19.99 per month, including shipping! The service also offers exclusive benefits such as discounts at the Bedly store, tips from experts as well as access to contests and giveaways! This prize pack includes: an accent pillow, an owl doorstop, and a candle holder. Celebrate Expressions offers inspirational jewelry, earth rugs, Maggie bags, grow bottles and more. Blessing rings are versatile charms that touch the heart. For your pocket, key chain or necklace. The Size of a quarter, Blessing Rings express individual poignant messages about all of life's biggest, unexpected and everyday moments. The Blessing Rings back is engraved with different inspirational and thought provoking terms of endearment. Individually hand crafted in pewter, the center is outlined with a symbol for a specific subject. Celebrate Expressions is offering three winners one of these great pieces to bring awareness to breast cancer: "Belief Cuff", Hope Blessing Ring on Leather Bracelet and a Hope Key Chain. NeoCell, a leader in the natural supplement and skin care industries. NeoCell develops nutricosmetics - nutritional supplements designed to enhance beauty - that are useful for skin, hair, nails and overall health. Products that are great for those who want to get a head start on looking and feeling their best. 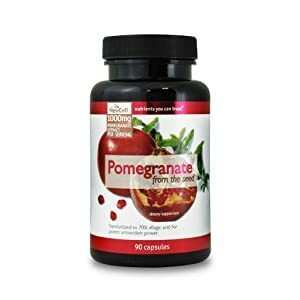 November is National Pomegranate Month and NeoCell is celebrating by offering Pomegranate from the Seed capsules to one lucky fan! In addition, NeoCell is extending a 3 Step Beauty System. This kit includes: Collagen Plus C Liposome Serum, The Collagen with Vitamins Herbal Beauty Mist and Neocell Advanced Hyaluronic Acid Lipsome Serum. These products are available on Amazon and on iHerb. Fantastic Sams, one of the world’s largest full-service hair care franchises providing the same quality services as independent salons, but at a fraction of the cost, makes a great option for everyday hair care or holiday makeovers. Find a salon near you here. This prize pack includes: a $25 Gift Certificate, fantastic style™ Styling Mousse and fantastic repair ™ Color Protect Conditioning Masque! Tighten and tone in just 45 minutes! It Works Body Wraps, through independent consultant, Misty Reynolds, offers the Ultimate Body Applicator. Use to target specific areas and be assured it's all natural and safe. Just put it on an area that you would like to firm up, wait 45 minutes and you won't believe the difference. Don’t let your makeup be the scariest part of your costume this Halloween! Real Techniques by Samantha Chapman is here to transform your Halloween or everyday look. Whether you want to look like Morticia Addams, Katniss from Hunger Games, Katy Perry, or just yourself – Samantha Chapman’s step-by-step tutorials on www.realtechniques.com will walk you through the tips and tricks of achieving the perfect costume look, helping you to look extra glamorous this Halloween! One lucky reader will win both the Real Techniques Eye Essentials Set and the Real Techniques Core Collection Set! Sometimes we see beauty in a moment, a place, a person and we want to capture it and hold on to it forever. Capture the Rainbow offers camera holders that allow beauty even while your camera awaits action. They say to never put your camera away when you have little ones in the home. That way you never miss that opportunity to capture that special moment or milestone! This blue camera holder is elegantly embellished with "A good snapshot stops the moment from running away". Thank you to all sponsors for supporting this monthly campaign against Breast Cancer. Against All Cancer. Thank you for being part of this giveaway event supporting Breast Cancer Awareness month of October. As part of our Campaign, we encourage you to make your monthly breast self-exams a priority in your life. The reason is simple – We want your life and the lives of the people you love and care about be filled with joy.
. Mommy’s Memorandum – Amazing place where life is never dull! Pittsburgh Frugal Mom – Making the most of any budget! But Wait! What's a Beauty without a FEAST? Be sure and enter the FEAST Prize Pack Giveaway, or link is in Rafflecopter. If there is one snack in this house that is the most wanted than another other it's popcorn. We even have an small version of an old movie theater popcorn machine that is an air popper. Normally we make a lot at once time and then bag it all in small snack bags, adding toppings to everyone's preference. When I heard that SMARTFOOD Selects - brand new products made with natural good for you ingredients. I about hopped through a hoop of excitement when I got this campaign. I began reading up on the flavors they had released and found out not only did they make popcorn, but also puffed corn and hummus popped chips. All of which had very unique flavor combinations that I've never seen before. If you haven't bought Halloween Candy yet here is a Coupon for $1 off 2 Mars Halloween Bags! Take advantage of the offers below allowing you to stack coupons for more savings! I have searched Pinterest, Google, and even liquor company's Facebook pages in search of the ultimate collection of ideas for Halloween Cocktails. Now I'm going to share them with you, my followers. These are adult cocktails, so if any one of you are having a Halloween Party this year or go to one and any of these cocktails are being served or you're the one doing the serving please come back and leave a comment on this post as to how awesome or horrible the cocktail recipe was! I say horrible, because sometimes a mix of things "sounds" good on paper, but truth be told once you mix it all together and take a sip you wish you were a zombie and had no taste buds! Combine blood-orange juice and liqueur in a large pitcher. Refrigerate for at least 30 minutes. Pour into test tubes or small glasses. In a shaker combine Midori, vodka, agave syrup, orange wedges and 2 fresh, torn basil leaves. Muddle. Add ice and sweet and sour mix. Shake. Add ginger ale. Stir and strain into chilled martini glass that has been drizzled with sundae syrup to give bloodshot eye effect. With the holiday season getting closer, now is the perfect time to stock up on holiday labels! Choose from thousands of designs, or create your own! Showcase your own or even your children’s creativity and upload your own designs of the prize-winning drawing hanging on your refrigerator, so everyone can admire your little artist’s creation. Personalize your own mailing labels for all the holiday cards you send out to family and friends. Label the care packages of your famous homemade chocolate chip cookies and brownies you send to your children in college to get them excited to come home for the holidays. You can even add a special photo of the newest members of your family when you mail your New Year’s letter detailing all of the wonderful changes to you family in 2012. And for all those gifts, you can add “to” and “from” fields to create your own special gift tags for your equally special presents. Click here to start creating your FREE labels. Halloween will be here in a few weeks and kids will be out collecting mass amounts of candy trick-or-treating. It was this specific holiday and all of that hard earned trick-or-treat candy that drove a 13 year old kid to a desire to "unjunk the world". Nicky Bronner had his Halloween candy confiscated by his parents which caused a feud. Nicky had then decided he wanted to take the junk out of candy and with the help of his father he set out to do so. After Nicky connected with Chef Adam Melonas, came a many trial and error, Nicky & Chef Melonas finally found the perfect recipe for unjunking junk food and the UNREAL™ Brands were brought to life. Nicky and Adam found the way to take the junk out of candy by eliminating the use of corn syrup, hydrogenated oil, artificial flavors, GMO's, and synthetic colors. They produced candy made from responsibly sourced ingredients such as traceable cacao beans, sustainable and organic palm kernel oil, dairy from free-range cows, all natural colors from plants like beets and red cabbage, eliminated 30% sugar, increased the protein to 60%, and added 250% more fiber than compared leading brands. UNREAL™ has indeed UNJUNKED Candy! Every now and then someone comes along that just makes you feel, well, feel awesome! Recently I had a person like that come along and I'd like to share my story about her and how she went above and beyond and didn't have to! Halloween is fastly approaching and of course every company has Halloween related items they released this time of the year. Softlips has hopped on the Halloween bandwagon too with the release of their Marshmellow Ghost Lip Balm duo that is only available in the check isles at Target Stores. Disclosure: In exchange for this blog post I will be compensated for entries in TCC's Marshmellow Ghost Lip Balm by Softlips Giveaway. Whether you are an expecting Mom, first time Mom with a newborn, or a Mom who has been down this road before there are certain essentials that a newborn baby or any baby of any age will most definitely need. Are you aware that as a parent to a newborn baby you will go through approximately 4700 baby wipes in the first two years of your baby's life? On average the first year parent will spend between $5000-$10000 just on baby essentials like diapers, wipes, clothing, furniture items, car seats, diaper bags, and so. Wouldn't you rather be spending more time with your baby instead of out going shopping from store to store in search of all the necessary essentials? The expecting Mom would probably much rather not be going from store to store in search of last minute baby items either. I bet you never really gave much thought to how much time is consumed shopping in stores and how much of that time you could be spending with your children or relaxing instead. There is solution to this time issue and that solution is the mygofer service. Trapped for 196 years by an evil witch ex lover (played by Eva Green) Barnabus Collins (played by Johnny Depp) is now released into a 1970's world and begins his mission to save the family business! But saving the family business does not come without some struggles. The creative mind of Tim Burton brings Barnabus Collins' story to film in Dark Shadows. On October 2nd Warner Brothers released Dark Shadows DVD and Blu-Ray. Along with the release of the movie also comes the release of the Dark Shadows app! The Dark Shadows app is an interactive app in which you can get your Horror-Scope, scroll through memes, play Barnabus' Terrorific Trivia, and take the Are You CREEPY Enough? Quiz! Share the app with your Facebook, Twitter, Pinterest, or Tumblr followers so they too can be entertained! In celebration of the Blu-Ray release and app release Kathy's Calm To Chaos Life is giving their followers the chance to win a Dark Shadows Blu-Ray Combo Pack! GIVEAWAY - One Kathy's Calm To Chaos Life follower will win their very own Dark Shadows Blu- Ray Combo Pack. Giveaway will run until 10/15/12 at 12:01AM est! I have made entries easy, simply interact with the app, share on Facebook, Pin to Pinterest, or even tweet! Do all the entries or pick the ones you'd like. Interact with the Dark Shadows app and then enter to WIN! Disclosure: I am working with Warner Bros in conjunction with this giveaway. Warner Bros provided me with the app code. All opinions are 100% my own. Now that we are into the month of October it's time to bring awareness to a major cause that plagues not only women, but men too. October is Breast Cancer Awareness Month. There are a ton of companies who put out products in to support this amazing cause. Left you can see Yankee Candles' Mandarin Orange Breast Cancer Candle. It smells amazing! Subtle yet strong, calm yet invigorating. I found this candle at the gift shop in Seneca Niagara Hotel and Casino! Next you have the NFL who turns PINK for the entire month of October. Players, coaches, and staff from every team wear pink themed or pink trimmed uniforms including sneakers, socks, gloves, even jerseys. Not only do the player do this, but the NFLShop offers a wide array of items for fans to buy to show their team support as well as raise awareness to Breast Cancer. Below you can see my white Boxer Zero sporting a Buffalo Bills Pink Jersey! Even the dogs get in on the support.. So remember THINK PINK during the month of October! Disclosure: I was not compensated for this post. Nor do I have any affiliation to the above mentioned companies. I'm simply showing my support for a cause.